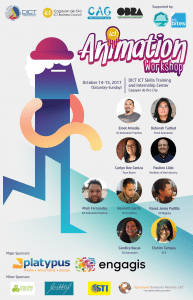 The CDO ICT Business Council, in partnership with DICT and Cebu Animation Guild (CAG), organizes The Animation Workshop last October 14-15, 2017 at the DICT ICT Skills Training and Internship Center, Divisoria, Cagayan de Oro City. The free workshop aimed to encourage and inspire local animators to organize themselves to improve their skills in 2D Animation, 3D Animation and Visual Effects (VFX). CAG brought in several of their top animators and members to the workshop, with skills and experience in the actual animation industry. Day 1 — Philmore “Emot’ Amodia, a respected representative of the guild, talked about the 2D Animation Pipeline. His wife and owner of Emottoons Studio in Cebu discussed the history of the studio and how it began. Deborah Tudtud, a 2D Animator show several ways how to become good at 2D Animation. Mr. Paul Llido encourages the crowd on how to start up a studio in the Animation industry and where to get help. Day 2 — Mark Fernandez opened the session with a discussion on the 3D Animation Pipeline, while Kenneth Garcia showed how to do 3D Sculpting. Mr. Raoul Jonas Padilla talks about 3D Rigging and how important it is, while Candice Bacas, a 3D animator from CDO and member of CAG, discusses 3D Animation. The last talk goes to Mr. Elohim Tampus, a Hollywood VFX artist from Weta Digital, on how VFX is successfully achieved and the needs of a successful VFX artist. He is behind some of the famous movies like Justice League, Black Panther, Twilight Saga, G.I. Joe: Rise of Cobra, Pirates of the Caribbean, Fast and Furious, Godzilla, The Hobbit: Battle of the Five Armies, Ex Machina, Batman V Superman, Man of Steel, Avengers, Captain America, Thor, etc. The entire workshop would not have been successful without the support of DICT and all its sponsors: Platypus, Engagis Creatives, Innovuze, STI-CDO, Scribbles and Specialized Outsource Partners.